When I'm asked – as I often am – isn't Eigg a long way away, I reply "from where?" Everywhere is a long way from somewhere, and with digital technology bridging the gaps between creation and consumption, between ideas and the market, who is a long way from whom? 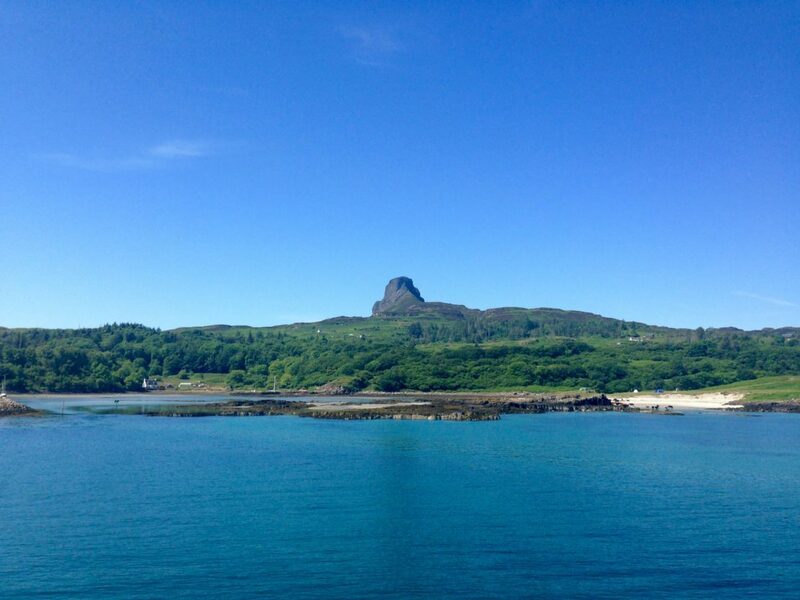 The Isle of Eigg, 12 miles off the northwest coast of Scotland is remarkable in many ways. Eigg is community-owned, generates its own electricity from renewable sources, has a population of just under 100, and a vibrant creative co-working hub of island-based businesses and visiting artists. Usually when I tell people that this tiny dot on the map punches well above its weight in any creative-industry mapping exercise, they're surprised. How can somewhere so remote, so small, support a creative hub: a concept more often than not associated with an urban environment? While the view from the windows might be very different, the experience for hub members in a city or island location is very similar. Whether they bring people together in real life or virtually, hubs offer sole traders and small companies support, companionship, and opportunities to collaborate with and promote each other. For some, particularly those in the early stage of their career or business, being part of a hub can offer validity – making what can sometimes feel small and personal, feel real and respected. Everywhere is a long way from somewhere, and with digital technology bridging the gaps between creation and consumption, between ideas and the market, who is a long way from whom? Many creative hubs are located in impressive buildings in some of the world's most inspiring cities. Others are a virtual network, or combine an online community with events and networking opportunities. Eigg Box combines many of these elements. With aspirations to eventually have a dedicated building, Eigg Box currently operates between community hall, cafe and the kitchen tables of the 20 per cent of those on the island who earn some or all of their living by working creatively. Traditional and contemporary musicians; textile, metal, willow and glass craft workers; writers; a creative producer; a graphic designer; and an aerial photographer all live and work on the island, and there's a recording studio and record label, too. Using the internet, businesses can promote and sell their work beyond the summer visitor market. In our interconnected digital world we can communicate, promote, collaborate – and plunder a vast world of possibilities; but face-to-face interaction, bouncing off ideas and sharing stories or advice feels, and is, different. Despite living on a tiny island in very close proximity to one another, getting together deliberately to talk creative shop over a bacon roll and coffee is a valuable way of maintaining focus and sustaining momentum. Similarly, finding time and making opportunities to engage with the many visiting artists and creative businesses that come to the island to research and develop work engenders a fruitful exchange of island innovation and off-island networking. For those who come, Eigg provides time, space and an intoxicating landscape of sea, sky, shore and hill to help expand ideas or create new paths. Off-grid living in a community of determined and practical islanders for whom creativity is a vital part of Eigg's largely agriculture and tourism-dominated economy provides a different perspective. Eigg Box was a response to a need to diversify our economy and the opportunity for an existing creative population to exploit their skills and talent better. Working together, with good broadband connections and the uniquely appealing and well-established Isle of Eigg 'brand', the opportunity to develop a market for creative products had potential. Building skills, confidence, networks and profile has been key to turning that potential into something powerful. By drawing on the talent and skills of those who live here already and demonstrating how operating from a geographically remote location can be an asset rather than a disadvantage, Eigg Box makes the remote central. What's in the Eigg Box? Eigg record label Lost Map represents nine acts from Eigg and across the British Isles, organising gigs and festivals in the UK and, increasingly, overseas. The company has successfully harnessed social media to drive fans to its website, selling digital downloads, CDs, vinyl and merchandise. Lost Map's most recent festival was Howlin' Fringe, a satellite to its main event Howlin' Fling, which ran during the Edinburgh Festival. Jenny Robertson works from home, knitting fine cobweb lace from hand-spun yarn. Her company, A'Nead Hand Knitwear, makes bespoke shawls, scarfs and gloves on the island. Spinning her own yarn from Scottish island fleeces, her cobweb lace is inspired by the nature and landscape of the island. Eigg Box has supported A'Nead, both financially and with training, helping build the business, which sells primarily online to an international audience; over the next 12 months Robertson hopes to focus on her wedding veil collection. 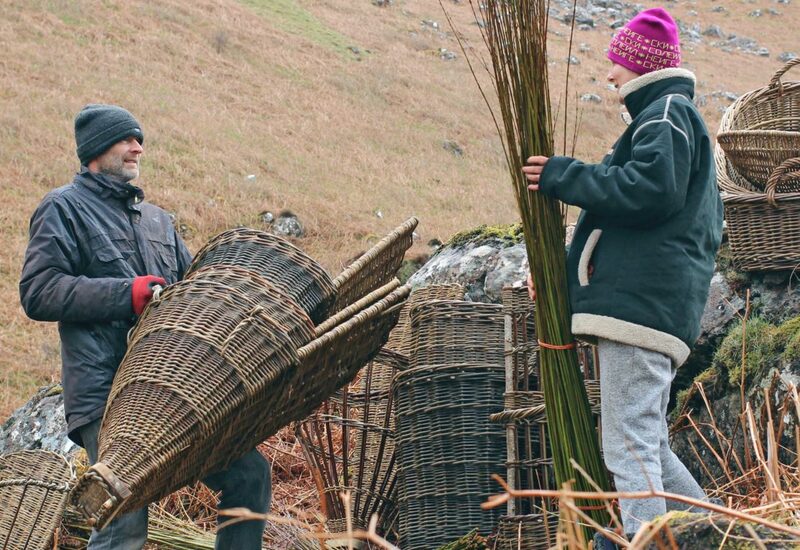 Catherine Davies and Pascal Carr of All About Willow design and make traditional willow baskets from organic willow they grow on their croft on the island. As well as selling their range of baskets online and at craft fairs in the UK and internationally, clients for their bespoke baskets extend from individuals just looking to the production designer for Outlander, who commissioned the pair to design and supply all the baskets for both series. Over the next year, Catherine and Pascal want to focus on commissions, while building a new custom-made workshop and teaching space on Eigg in which they can offer residential teaching courses. 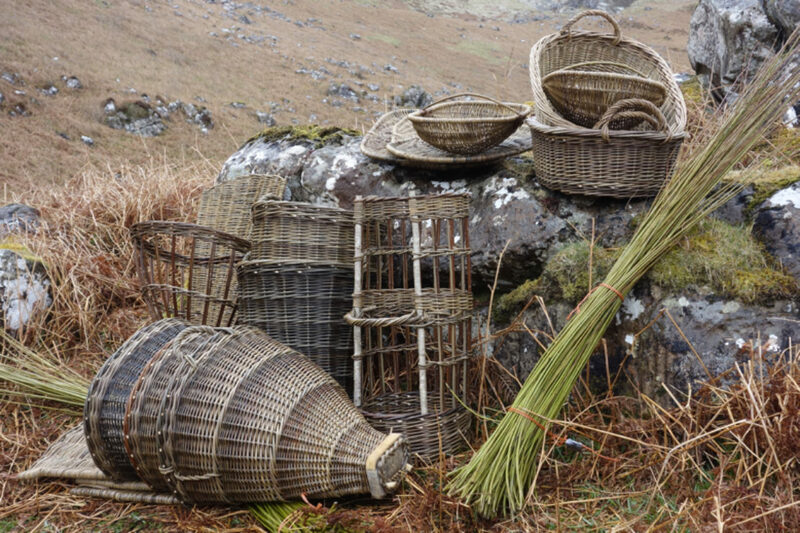 Eigg Box has provided access to marketing support and business skills training, and funding for Davies and Carr to gain new skills in specific basket-making techniques to develop new products.